Birthing Pod on a stick, that's how the ability on Prime Speaker Vannifar shakes out, and that's pretty scary. Vannifar has many implications across Magic as being "a slightly more fair Birthing Pod " and this is so close to the truth, it hurts. Right off the bat, we have to talk about what's different and WHY. To start with, Birthing Pod is technically cheaper to play, as it costs one Phyrexian Blue and three colourless, compared with one Blue, one Green and two colourless. 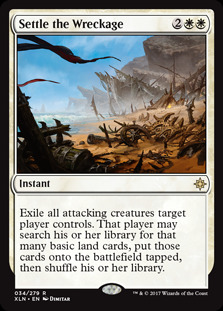 This means that you're unable to cheat out Prime Speaker Vannifar on turn TWO. 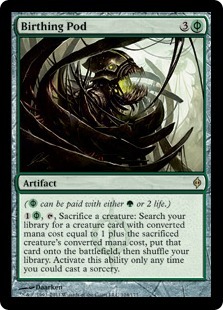 Also, Birthing Pod is an artifact, meaning it is harder to destroy AND it comes on line the turn you play it. Prime Speaker Vannifar is a creature and therefore has summoning sickness. Now, pod has an activation cost, but really no one ever pays it, instead they opt to pay the ferryman the life. But hey, don't let me rain on your parade, because Poddifar WORKS. Even in Standard. PLEASE NOTE: Wizards gave me a special account recently for an event, thanks Wizards for letting me get my hands on all the cards early. Five 1 cost, nine 2 cost, six 3 cost, nine four cost, two five cost and two six cost creatures. We have four slots devoted to a SINGLE spell, the remainder is lands. But you probably want to know why we're not playing many spells, right? We want to maximise what we can do with Vannifar, so we use creatures AS spells where we need because we can effectively tutor them up and spit them out. 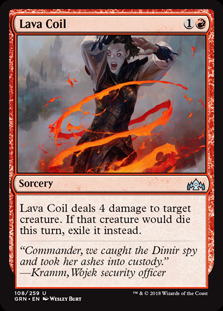 The only spell we run is four copies of Dive Down , because we will need to protect Prime Speaker Vannifar against a few decks such as Golgari running Cast Down and especially against the current scourge of standard, Mono Red aggro running Lava Coil . Both of those decks and seriously wreck your podracing. The toolbox itself is interesting as we have decided to go with a BANT shell, however I'm not totally sold that this is the best version of the deck as yet. 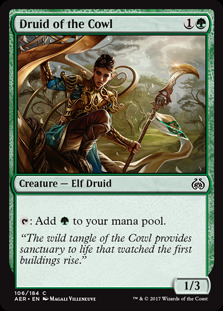 We are running four copies of Llanowar Elves and Druid of the Cowl to help us power out Prime Speaker Vannifar a turn earlier, or at least on curve have mana open for Dive Down to make sure Vannifar doesn't meet an unfortunate death. 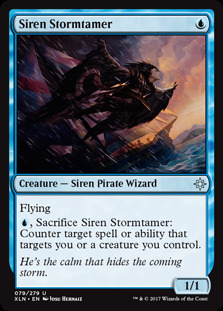 A single copy of Siren Stormtamer also acts as if we have a fifth copy of Dive Down as well as being a 1 CMC fodder for podracing. 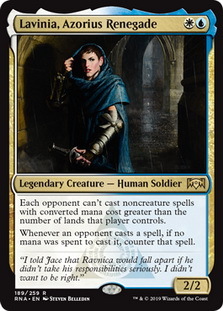 At two CMC we have a single copy of Lavinia, Azorius Renegade for.... reasons? Look, I thought she would allow us to stop Thousand-Year Storm , but reading the card explains how dumb I can be and it doesn't stop it at all. 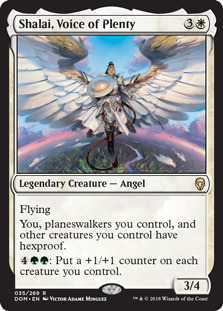 She does, however, stop creature ramping via Llanowar Elves as well as convoke decks like March of the Multitudes , so even though she is limited in scope, time will tell if she ends up making any impact. Four copies of Tithe Taker and if you haven't read this most excellent dude, now is the time to take a good long HARD look at the amazing card design. On your turn, Tithe Taker makes all your opponent's spells and activated abilities cost an extra generic mana. 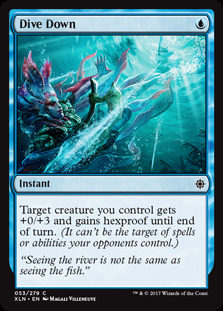 This assists us in not only "taxing" our opponent on our turn and making plays MUCH harder for them, it also STACKS with each copy. If Tithe Taker meets an unfortunate end (or we pod him away), he leaves behind a lovely 1/1 flyer that we can pod away later on, should we need to. 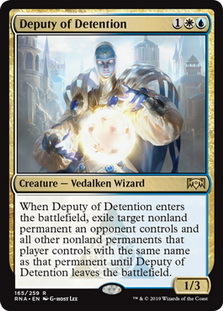 At three CMC and not unlike the pod decks of old, we are running three copies of Deputy of Detention to help lock down troublesome permanents that are going to get in our way or lock us out like Ixalan's Binding . These are rarely going to be on your "pod away" list and more on the side of your "OH CRAP I NEED TO GET RID OF THAT THING" list. 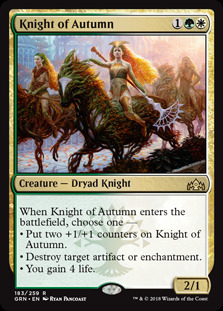 A single copy of Knight of Autumn is actually far more useful than anything else and could likely be bumped to two copies. This rather innocent looking band of horse riding elves get the job done, or rather, three jobs? 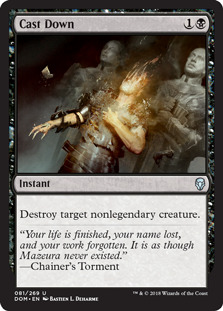 Modal spells have ALWAYS been good in magic since they were introduced and the ability to make her bigger, give you a life buffer of four OR destroy an artifact or an enchantment is pretty big. 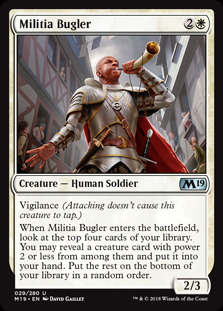 Three copies of the most excellent pseudo tutor Militia Bugler is great, a 2/3 with vigilance that can tutor through your top four cards to snag a creature with power two or less will usually hit something in this deck. At worst, it will provide a ramp into the next four CMC creature. 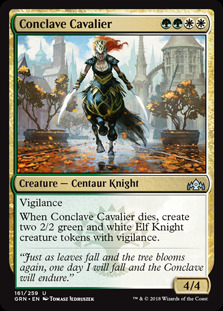 Hitting the four CMC range starts with Conclave Cavalier at three copies and she isn't that exciting, but when we pod her she leaves behind two 2/2 vigilance tokens that help us to get more bodies on the floor. On her own the's a 4/4 Vigilance creature, so she's not THAT bad, but also not as amazing as some of the others in the deck. 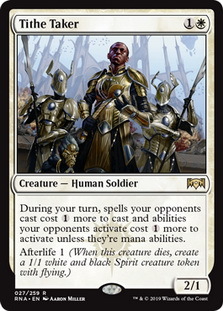 Four copies of our STAR, Prime Speaker Vannifar is a must for this deck. 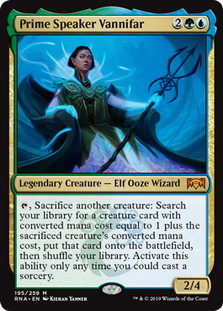 Poddifar allows us to tap her out to sacrifice one of our other creatures to look for a new creature that costs one more than the one we sacrificed. see the top of the page for more on her. Two copies of one of the best creatures in standard Shalai, Voice of Plenty .... Wait, there's a meme for this right? She protec, she attak, she makes sure Settle the Wreckage is useless. Am I doing this right? Shalai is simply put the most amazing creature around, making it so that burn decks have to kill her before they can aim anything at your board or you, Settle is useless until they deal with her and I could go on but I think you get the point. 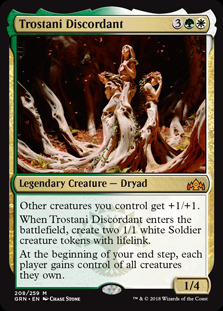 At five CMC, we have a single copy of Trostani Discordant as she provides two 1/1 tokens with lifelink when she enters play and buffs all your dudes with a healthy +1+1 glow. She also returns to you any creatures an opponent has stolen with cards like Entrancing Melody and though that may sound unlikely, it still happens due to the Mono U attack deck. 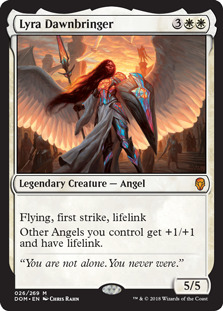 A single copy of Lyra, Dawnbringer because she's a good bridge from five to six CMC but also a solid 5/5 lifelink first strike flyer. You will likely not pod her away because she's a top end threat that can end games quickly in your favor. One copy of Azor, the Lawbringer because he closes out games fast. 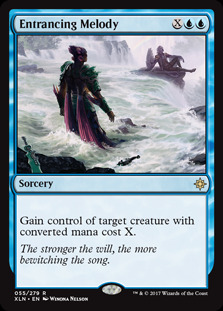 When Azor hits play, your opponents can't play spells on their next turn meaning no sorcery speed removal can stop your nefarious plans! In addition, Azor is a nice fatty flyer at 6/6 but also can net us a bunch of life and cards if we need it due to his ability. 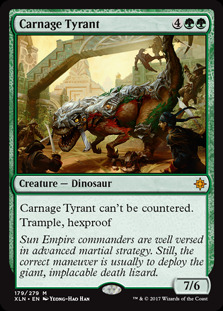 The last, and perhaps best card we are are playing, is Carnage Tyrant , a 7/6 trample hexproof hosebeast that can't be countered and gives control fits of pure death. 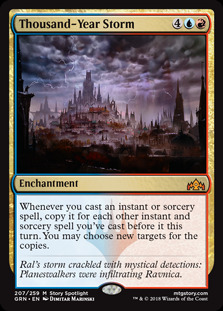 Ravnica Allegiance is out NOW on MTGO and MTG Arena, so go brew some jank and I will talk to you soon! 2 small errors: Pod is Phyrexian green, not blue. Vannifar is immune to Cast Down, but not Price of Fame. Also, you can't choose to pay life instead of the whole activation cost. You still need to pay 1 per activation. And Lavinia does nothing against creature spells, unless you pay no mana for them. "Creature ramping via Llanowar Elves" is entirely outside her purview unless the payoff is a noncreature spell.